Big Finish: Doctor Who CLASSIC DOCTORS, NEW MONSTERS Vol 1 Review | Warped Factor - Words in the Key of Geek. Classic, New, Tony loves it all. Sing, choirs of dry-eyed angels. After dabbling with Strax and River Song, and the explosion of joyous motormouthery that was The Tenth Doctor Adventures, it’s finally here – the answer to every fan-fictionalist’s prayers. 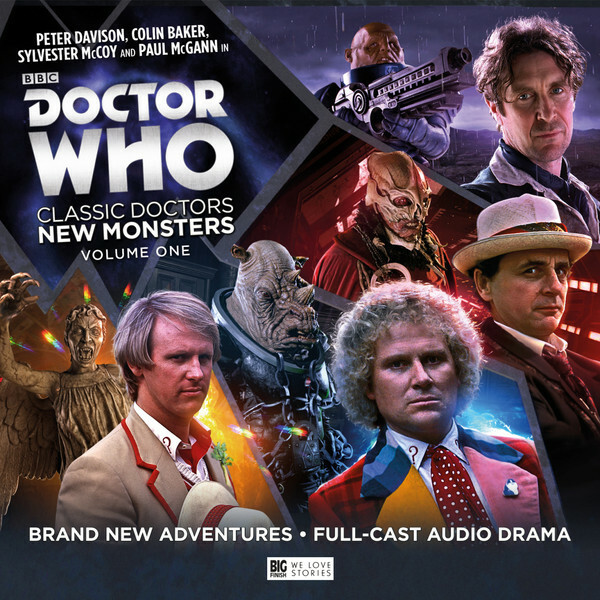 The first set of stories with Classic Doctors and *cough, cough Sontarans* New Monsters from Big Finish has landed. You want the headline? At least three out of four times here, the writers prove precisely why they’re writers for Big Finish, and…you’re…not. Let’s start at the very beginning. A very good, if relatively unimaginative place to start, as Phil Mulryne proves in Fallen Angels by starting either at the beginning or the end, depending on your point of view. Of course, we think we know something about the Weeping Angels. Quantum locked, don’t blink, steal your time and let you live to death etc etc. But right out of the gate, Mulryne says no, that’s not what this is principally going to be about. He gives us a magnificent mystery set-up, looking at the ceiling of the Sistine Chapel and then blithely telling us it was never finished, because Michelangelo disappeared before he could finish it. When a honeymooning couple get touched by an angel and zapped back to the sixteenth century, they run into that strange man they met in the chapel – the one with a stick of celery in his lapel. And between them, the Doctor and Joel and Gabby Finch investigate the Case of the Missing Michelangelo, as played here by a marvellously grumpy Matthew Kelly. For years in Britain known for his game show work, people have a tendency to forget Kelly was a classmate of the likes of Julie Walters and Pete Postlethwaite, but here he gives everyone a quick reminder of his dramatic chops as the artistic genius. There’s a really engaging thriller here too, with secret orders of monks with mysterious commissions, and the question, dabbled with here, of where the angels actually come from. Plus there’s a Fifth Doctor allowed to be what he rarely was on-screen, in control, authoritative, quietly in charge of proceedings, and it’s a side of the Fifth Doctor that makes so much sense it aches because we had so little of it in the on-screen years. 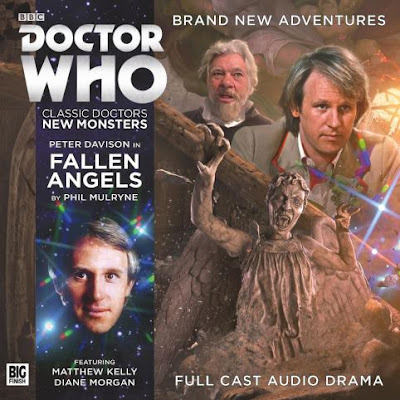 As a starter to this set of stories with their particular challenges, Fallen Angels emerges as a kind of Doctor Who meets Dan Brown story, and acts as a properly bracing breath of fresh air that thrills and reassures in equal measure. After finishing this story, you feel that Big Finish has done this Classic Meets New thing, which could so easily have been a disaster, with enough polish and pizazz to make it a set worth owning. Judoon in Chains, by Simon Barnard and Paul Morris, has an extra challenge again – the Judoon, unlike the Angels, were more or less created to be dim, to be a very particular type of villain, a bureaucratic species of grunts. Like the Sontarans before them, they can easily be used in a single direction, as a force with which it’s important not to tangle, but to make them broader than that, to give them a sense of culture and an expanded emotional or philosophical range, is extremely tricky, if not antithetical to the whole nature of Judoonism. That’s a conceit that’s used very cleverly in Barnard and Morris’ script, and to possibly the most beautiful effect we’ve heard in a Big Finish story in quite some time. The tale of Captain Kybo and his growing awareness of emotions and thoughts that are unJudoon, as well as the somewhat Elephant Man treatment to which he’s subjected on 19th century Earth, will give you a lump in your throat, and the Sixth Doctor’s trademark combination of moral outrage and staggering compassion prove once again what an under-utilised incarnation Colin Baker’s was on-screen. The effect of a radical thinker in a society where blind obedience to commands is the norm is touched on here too, and one ends up feeling distinctly sorry for the Judoon as a species, in the same way one can feel sorry for those of our human brethren who cannot see the beauty around them, or who feel the need to hurt others for the crime of being different. 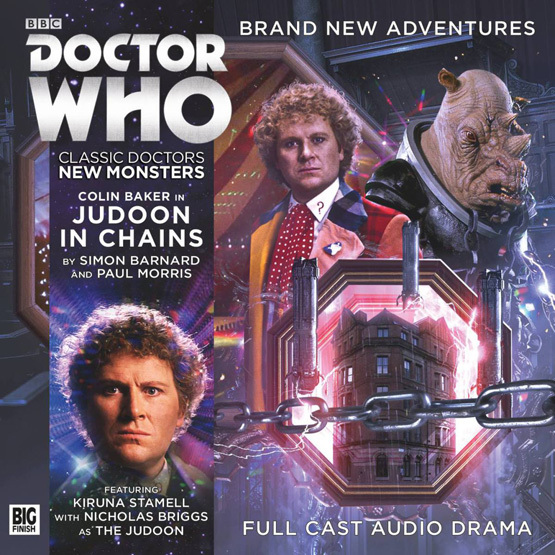 We can say without fear of contradiction that Judoon in Chains is one of the most emotionally engaging, moving Big Finish stories we’ve heard in years, that does everything it needed to do, and then does more besides. 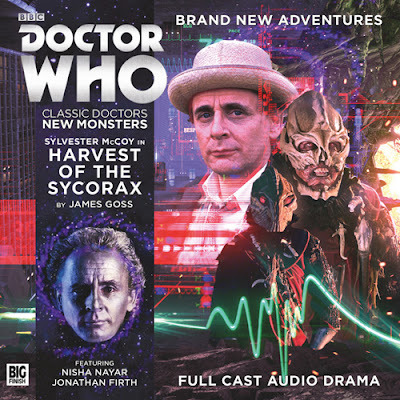 Harvest of the Sycorax, by James Goss, feels like a weak link in the chain, but only really because the other stories in this collection take on the challenge of expanding what we know about the main villain and succeed. Goss’ script is a perfectly good piece of Seventh Doctor science fiction, conjuring a future in which – not unlike the Earth of Gridlock – humanity has injections and patches for practically everything that deviates from some template of normality, allowing the species to be homogenised in terms of emotional expression and experience. But where Fallen Angels ponders mysteries and dabbles with where Angels come from, and Judoon In Chains gives us a pathway to turn the Judoon from marching cretins into the broader, more brilliant creatures they could be, Harvest of the Sycorax sticks pretty closely to what we already know about the skull-helmeted numpties – trial by combat, blood control, even the increasingly tedious chanting of self-aggrandising slogans. Goss does expand the potential of blood control, and the Sycorax’s command of it as a science, and McCoy gives a lightness of touch to the otherwise somewhat gothic blood-zombie story elements, ‘foreshadowing’ the Tenth Doctor’s treatment of the Sycorax as more than a little quaint, but after two powerhouse episodes, Harvest of the Sycorax feels like a smaller imaginative leap despite being full of perfectly good ingredients, because it sticks closer to the original source material than the others do. Yes, yes, yes, we know. The Sontarans have been knocking around the universe since 1973. But we’re going to invite you to get the hell over it, because a) they’re here, all official and stompy, and b) The Sontaran Ordeal is written by Andrew Smith, who just a few years ago took the Voord and gave them whole new levels of oomph and scariness, so this is a writer who knows a thing or two about taking an established enemy and making them ‘new’ all over again. Nor does he disappoint in The Sontaran Ordeal. Here’s the thing about the Sontarans: they’re one of the most enigmatic species we’ve encountered in over fifty years of Who. Yes, we know certain things about them, but, as was typical of Robert Holmes’ writing style, he gave us just enough to make us think we knew them inside out, while actually knowing very little. They’ve been added to since then, but rarely with the imaginative openness that Smith brings to them here. What happens to a Sontaran who’s disgraced but alive? Does he get vapourised? No – at least in theory, like the animals of Animal Farm, and the apes of Planet of the Apes, Sontarans do not kill Sontarans. What they get is subjected to Ordeal – an intentional suicide mission. 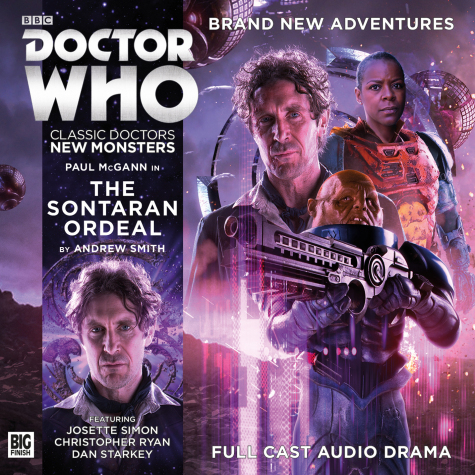 That’s the fate of Jask, the lone Sontaran the Eighth Doctor meets on the planet Drakkis (a world ravaged by the Time War). Classy performances from Dan Starkey as Jask, Christopher Ryan as his C/O, General Stenk, and lost Blake’s 7 member Josette Simon as Sarana Teel help this story belt right the hell along, to right a wrong among the Sontaran ranks, add a layer of texture to our understanding of Sontaran society as a whole, and give the Eight Doctor a turning point in his attitude to the war – a presumably irresistible opportunity for any writer and Who-fan. All round, Big Finish delivers a combination of the old and the new here that blends the ‘parts’ of the continuum into a seamless whole, convincing us that the New Monsters are only new because we haven’t seen or heard stories with them before. Go get it – there are stories here that are bright and rich and glittery and that will remind you just why you love Doctor Who so much, whether you’re a fan of the Classic, the New, or both.